With any large group exhibition, having many different artist submissions accepted is both a curatorial blessing and a challenge. On one hand, every conceivable juxtaposition of works has the potential to tell a truly exciting story, while on the other, it can be an obstacle to figure out where some outliers should be displayed, whether they be outliers in terms of quality or subject matter. The Philadelphia Photo Arts Center Members Show, up earlier this month in the Crane Building, is a good example of the logistical and artistic difficulties inherent in working with so many diverse voices, styles, and subjects, even within the singular medium of photography. The works are divided into roughly four different clusters in the large, airy space of the Photo Arts Center, but they don’t seem to be necessarily linked by particular photographic technique, subject matter, or even aesthetic; instead, the various themes that spring up are made present here and there amidst smaller groupings of between two and four works at a time. This decision is where the strengths of this Members Show lie, as well as within individual works themselves, even when the larger groupings don’t seem to have the same cohesion. A pairing of two crisp photographs by Betsey Hansell and Dore Vorum, for example, is cleverer than it initially seems. 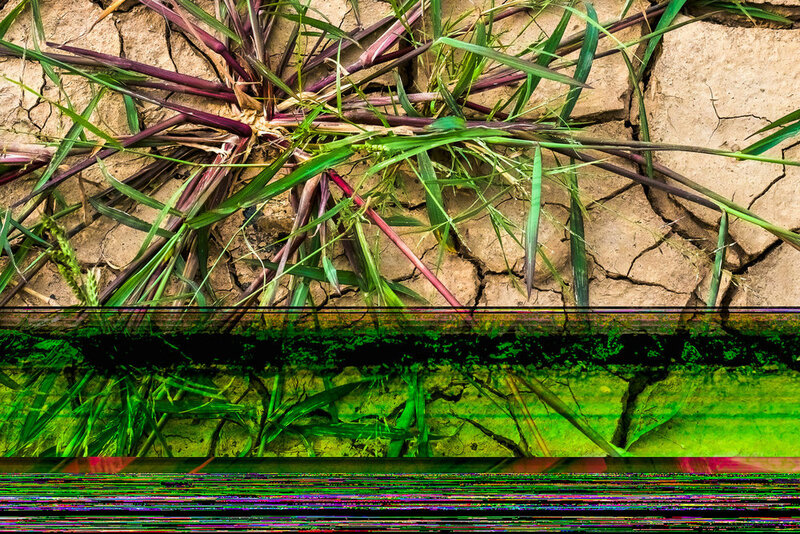 Here Comes the Sun by Vorum, is abstract, awash with slippery color residue and small air bubbles, while Hansell’s contribution, Untitled, is a more straightforward piece of nature photography, depicting a spray of green spiky leaves laid atop a ground of dry, cracked earth. Yet stepping back from the two works reveals that as different as they may seem, these two works match compositionally: both images are horizontally oriented, with a brownish form that stretches across the painting about four-fifths of the way down. Additionally, the sharp lettering on what seems to be a glass surface in Vorum’s photograph echoes the type of leaves that populate Hansell’s. This pairing is the strongest in the show overall because it does what an exhibition ought to: it makes you look hard at the works of art themselves, allowing you to see new things with each (in this case, comparative) glance. Another such pairing on the adjacent wall would be wholly successful were it not interrupted by the insertion of a third photograph in between the two relevant works. John L. Stritzinger’s Billowing Blue and Ray Felix’s Hall to Viewing Room have similarly ghostly, unsettling atmospheres: Billowing Blue captures a curtain caught in a breeze by an unseen interloper, while Hall to Viewing Room bathes its similarly un-populated composition with sickly green, turquoise, and red-pink hues, giving off the impression of a still from film noir. The two works’ opposing approach to motion also encourages the viewer to think of these two works as a set, which is then sadly ripped open by Richard Davidson’s abstract photograph Untitled—itself an intriguing work, but one that doesn’t fit within the rhythms set by the works flanking it. The final thematic sub-grouping in this show is unique because of the all-too-relevant narrative it seems to spell out. It’s easy to miss, as it’s just three small photographs hung by the door that connects the Photo Arts Center to the rest of the Crane Building where it’s housed. Jay Roth’s The Idea of American Exceptionalism immediately sets the tone: the work depicts what seems to be an abandoned office building, its glass doors smeared and scratched, the building surrounding it covered in rust stains, with a large-scale photograph of an American flag blowing in the breeze peeking from behind the doors. 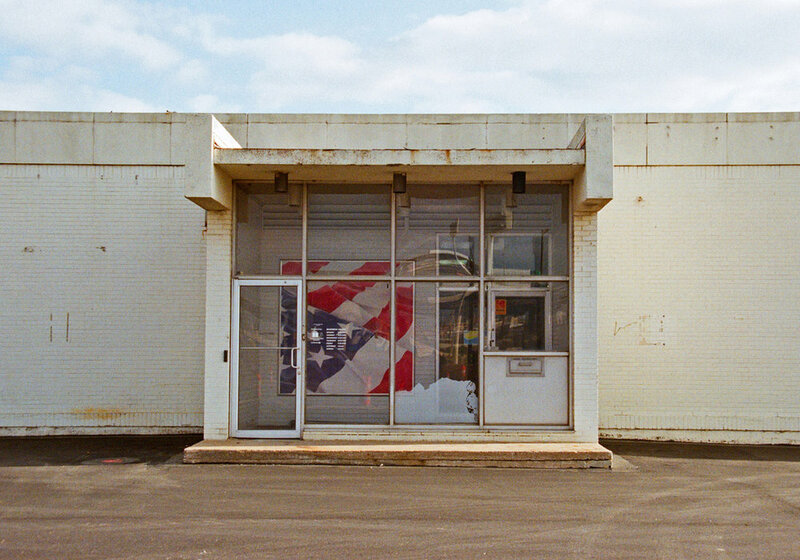 In and of itself, the photograph makes a powerful statement: by depicting the American flag as not only locked away behind glass doors—literally separated from anyone who is outside the building—but as also housed in a building that is succumbing to neglect and exhaustion, Roth asks the viewer to think seriously about American exceptionalism in 2017: who is American exceptionalism for? Who has access to this storied ideal, and who doesn’t? And if the foundation of American exceptionalism is beginning to crumble, is the idea becoming a relic—an abandoned edifice, like this office building seems to be? The other two works in this grouping, Covanta, Camden by Lorraine Terrell and Two Houses on Tangier Island, Virginia by Mary Walton, work in concert with The Idea of American Exceptionalism to further the overall narrative, as well as provide what functions as a cheeky, pragmatic solution to dealing with the destruction of the idea of America as unique among nations (and therefore automatically superior). Two Houses is placed above Covanta, and depicts a perfect little slice of Americana: two small wood-frame homes, one white-and-blue, one yellow with a teal door, sitting atop a verdant green lawn on a sunny day. Covanta, the final work in the cycle (if we are to read it as such, and read it left-to-right, top-to-bottom), captures a moment in the late afternoon, with moody clouds looming overhead, of a set of train tracks (that very well could be anywhere on one of Philadelphia’s regional rail lines), with a train light slicing the composition almost fully from bottom to top. Taking the three works together, then, we have not only a potential narrative but a gradual temporal shift: Roth’s work looks to have been shot in early morning light, Walton’s during the day, and Terrell’s in the evening, providing the bulk of a day’s cycle. Expanding this idea further, if we question in the early morning the usefulness of American Exceptionalism, and decide that we don’t need it anymore, we then return to our homes in the middle of the day to fortify ourselves before getting on that evening train and moving on to somewhere different—to a different state of mind regarding what it means to be an American in the world today. One final standout work in this show is Clarify, by Makeda Robinson, who was recently featured in an exhibition of teen photographers in the Crane Arts Building several months ago. The photograph is simply astonishing, and all the more so for having been created by such a young artist: a mysterious hooded figure wearing a silvery Anonymous mask trails a arching plume of red smoke across a bright blue sky. The composition itself is balanced and dynamic, with the contrast among the red smoke, blue sky, black clothing, and silver mask making the work impossible to ignore. The sheer amount of works on display in the Philadelphia Photo Arts Members Show—over forty individual photographs—makes it an almost overwhelming experience. While some works are less impressive than others—a few too many of the photos suffer from “Instagrammification syndrome,” making them look like they’ve just been run through a filter on the ubiquitous app—there are indeed some truly exciting talents to watch.